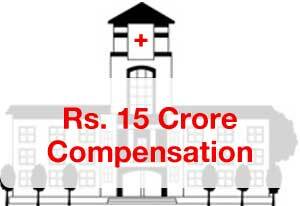 The Supreme Court on Thursday directed a medical college in Lucknow to grant compensation of Rs 10 lakh each to the 150 students it had admitted in the MBBS course without having due permission from the government, besides directing a refund of admission fee. The apex body in no uncertain terms has also debarred the college, in question, GCRG Institute of Medical Sciences from admitting students for the next academic year commencing 2018-19. TOI reports that the Supreme court has further imposed a fine of Rs. 25 lakh to be deposited with the Supreme Court registry within 8 weeks. Besides the action against the medical college, the court was also seen reprimanding the Allahabad High Court bench for allowing the admissions. The college was among 32 colleges that had been denied permission by the Centre to admit students for two years. The GCRG trust had challenged this in the Supreme Court. But on August 28, it withdrew the petition from the apex court with the latter’s consent and filed a petition in the Allahabad High Court the next day. The case indeed became controversial in the month of September when one judge of a two-member Allahabad high court bench made corrections in his own hand to the original order to allow the medical college to admit students to MBBS course for 2017-18.The above order went against the SC direction that the lower court was not to issue an interim order pertaining to admissions for the year 2017-18. Commenting on the Allahabad High Court’s order allowing the institute to admit students in violation of its order, the apex court bench, comprising of Chief Justice Dipak Misra and Justices A M Khanwilkar and D Y Chandrachud has called it an act of “Judicial indiscipline and impropriety”, reports the TOI. The court had earlier remarked, “We really fail to fathom the manner in which the high court has misconstrued our order and passed the final order for 2017-2018, ” reports HT. This overlooking by the High Court led the apex court judges to say, “It is most unfortunate, which may cause [an] institutional problem,” The bench further gave the lower court a hint that the issue may be taken up by the Supreme Court on the administrative side. It is reported that Medical Council of India (MCI), the country’s medical education regulator, had moved the top court against the high court’s order. Meanwhile, MCI’s Senior Counsel Vikas Singh and lawyer Gaurav Sharma, informed the bench, that the High Court had given permission for student admissions despite the college not having the Centre’s sanction, and also overlooking the infrastructural, faculty and clinical material deficiencies pointed at by the Council. “Catena of cases has categorically held that in matters relating to medical and dental colleges, the High Court should refrain themselves from allowing admissions by way of orders as the same will jeopardize the career of students,” the MCI Counsel argued in the Supreme Court, reports the Hindu. The College Counsel Advocate Rajeev Dhawan arguing in defense said the institution should not be held liable for the wrong committed by the High Court. However, the apex court stayed firm on its directive to the college. Reprimanding the GCRG Memorial Trust severely, for having played with the careers of students, the court while quashing their admissions reinforced that the college will have to compensate for jeopardizing their futures and “polluting young minds” by making them party to the violation. It is not only that college which has admitted students other then the govt. counseling . In year 2016-17 almost all the new colleges that were granted permission have admitted students after the govt. Counseling stopped on 7th oct. 2016. The list of extra students are there with the Directorated of medicine office jawahar bhawan. That year student dint get legal admission. The colleges wasted one year of the student life by false promises. Even today some are attending colleges in pretext that they will get legalised. CJ Dipak Mishra was himself in a conflict of interest just last week while heading a Bench adjudicating Lucknow based Prasad Education Trust\’s WP(Civil) No 797/2017 regarding permission for their Medical College. As per taped conversation, retired Orissa HC judge Quddusi had assured favourable judgment from SC in a matter pertaining to a Lucknow based Medical College. It has been surmised that Quddusi would have SC for the purpose. A Double Bench had referred Quddusi affair to 5 Judge Constitution Bench. But CJI obviated this referral on grounds of judicial propeiety through a self headed 3 Judge Bench Judgment. True. CJI should have recused himself and should have allowed the 5 judge Constitution bench to hear the matter of judge Quddusi. The judges need to be seen to be accountable and seen to uphold the Constitution and the law. What honarable supreme court verdict it is welcome because so many medical collages are cheating students and teaching faculty swell\’s MCI during Inspection without basic facilities they are running the collage.their one point programs is Money making. actually it is the misuse of unlimited unaccountable powers of judges of India,who are never punished butpunishment always goes to nonjudicial person/party which needs to be corrected for rule of law & uprooting of corruption. Absolutely. Will the Hon. Judges submit themselves to some accountability procedures. It must be remembered that before the National Law Schools were established, most entrants to the judicial system were the left overs of the cream of students taking up other prestigious professions. The legal system has entrenched corruption. A citizen would think a dozen times before approaching any court for redressal. It is WRONG to blame the understaffing of courts. Time the highest court First set its house in order.